Loretta Boskovic never dreamed she would end up a single mother with two kids in a dusty Australian country town. She never imagined she’d have to campaign to save the local primary school. She certainly had no idea her best friend would turn out to be the crusty old junk man. All in all, she’s starting to wonder if she took a wrong turn somewhere. If only she could drop the kids at the orphanage and start over . . . But now, thanks to her protest letters, the education minister is coming to Gunapan, and she has to convince him to change his mind about the school closure. And as if facing down the government isn’t enough, it soon becomes clear that the school isn’t the only local spot in trouble. In the drought-stricken bushland on the outskirts of town, a luxury resort development is about to siphon off a newly discovered springwater supply. No one seems to know anything, no one seems to care. With a dream lover on a Harley unlikely to appear to save the day, Loretta needs to stir the citizens of Gunapan to action. She may be short of money, influence, and a fully functioning car, but she has good friends. Together they can organize chocolate drives, supermarket sausage sizzles, a tour of the local slaughterhouse—whatever it takes to hold on to the scrap of world that is home. Loretta Boskovic doesn’t take herself too seriously, her love for her kids is palpable, and her sense of social responsibility is admirable. 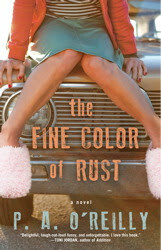 She’s an easy character to love and root for and The Fine Colour of Rust is both humourous and heartwarming. Loretta’s fantasies about being whisked away from her life by a gorgeous man with fancy wheels had me giggling all the way through. You know it’s just her fantasy and you can’t help but relate. Who hasn’t wanted to disappear at any stage, particularly mothers with children having a ‘moment’? Loretta wasn’t the only character to make me titter either. The Fine Colour of Rust has a cast of quirky characters including Loretta’s unusual best friend - not only an older man, but a junk dealer. Her female friends provide amusement as do almost all the characters in the town. And even though they’re quirky, they all come across as incredibly real. Despite the humour, The Fine Colour of Rust is also heartfelt and has serious undertones, from dead beat dads to a struggling single mother as well as political and social issues. This novel held many moments that made me sit back and think and I even shed a few unexpected tears. O’Reilly’s writing style is easy to read and I loved that this novel takes place in Australia, where my brother has been living recently for school. I have yet to visit, so this novel was a nice introduction to the country (and didn’t frighten me away as much as Bill Bryson’s Down Under). The description in this novel is perfect for my tastes- just enough information about the area, the oppressive heat and the small town angst and doesn’t get bogged down with too much detail. The Fine Colour of Rust is about real life, which makes it utterly relatable. There are no fancy shoes to be had. Instead we follow a single mother struggling to make the best life she can for herself and especially her kids and anyone can relate to this, even if you’re not a mother.